The joyful news was confirmed also by Tatyana Ovechkina, mother of Alexander Ovechkin. Happy grandmother revealed baby name. - Everything went fine, we have a grandson, a continuation of the family. A good guy was born, Serezha, charming at all". Soon the happy mother published the first photo of her baby. 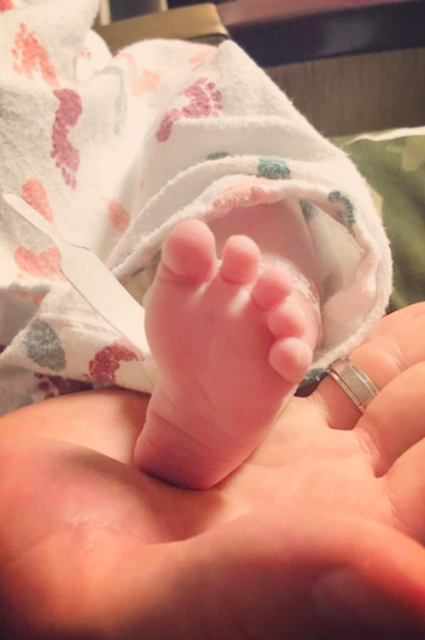 In the photo, posted on Instagram, Alexander is seen holding the tiny leg of Ovechkin, Jr..
"08/18/2018. Thank you, my girl, for the most beautiful day in my life, "Alexander Ovechkin thanked his wife. Pregnancy rumors had been circulating in the media since 2016. It was in that year, a celebrity couple officially legalized their relationship (a celebration on the occasion of the wedding took place a year later due to the preparation of hockey players for the World Cup). However, not a single press report found confirmation. The fact that they really become parents, Alexander and Nastya announced themselves in early June, without saying a word. After the victory of the Washington Capitals in the Stanley Cup - 2018, played by Ovechkin, Shubskaya went on ice to congratulate her husband on triumph. And then it all became obvious - Anastasia did not think to hide her baby bump. Recall, Alexander Ovechkin and Anastasia Shubskaya played a posh wedding in July last year. In June 2018, a hockey player won his first Stanley Cup. Literally a few days after that it became known that the couple is expecting a child.